1. Cut aubergine into slices. 2. Boil slices in water with some salt. Be careful not to cook them for too long, so that they don't get too soft. Approximately 5 minutes is enough. Take slices somewhere to cool down. 3. Let them cool and after that add some salt. 4. Make the mustard sauce mixing all other ingredients. Add spices depending your own taste. 5. Mix slices into the sauce. 6. Store in the refrigerator. Choices: you can also add to the sauce for example soy yogurt / lemon juice* / sliced red onion / onion / lemon pepper or different peppers / seaweed and so on.. 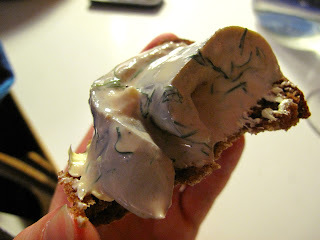 Herring is good for example with potatoes or with bread! Used also as a xmas dish.